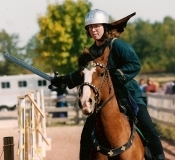 Dressing your horse in a medieval manner means you need to match as well. So sewing human clothing was a necessity. But when the riding is done it is nice to strip off the sweaty riding gear and dude up in something fancy to party in. Here are some of my projects. In the 1400s, a Christian woman in Muslim Spain usually had a great deal of resposibility, with a surprising amount of freedom. Silks and cottons were the common fabrics. 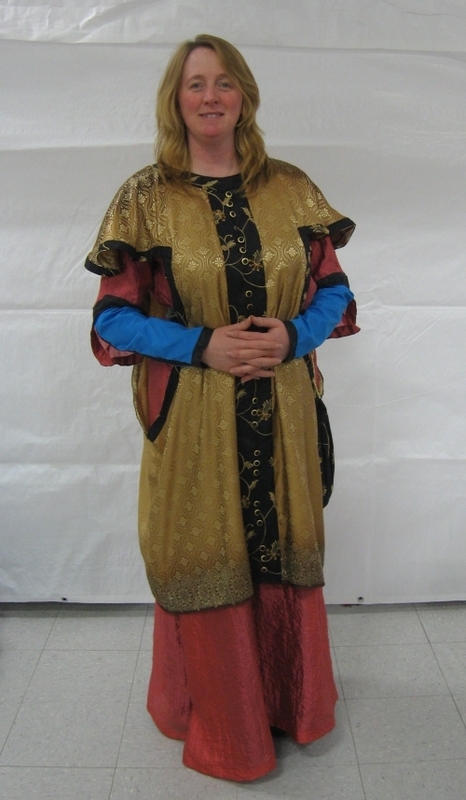 Here Lady Christine is wearing a multilayered outfit. The underdress, which she sewed herself, is turquoise cotton with black trim on the tight fitting sleeves. 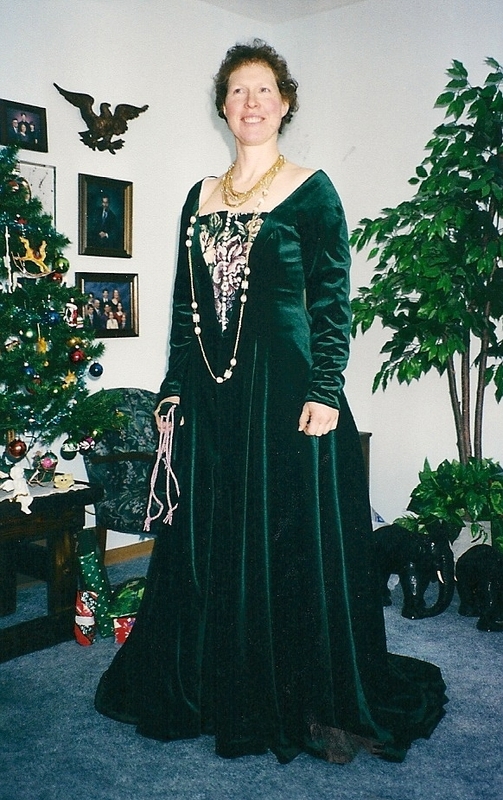 The second layer is a faux silk (ok, polyester, but it looks nice and decent silks are hard to find by me) with elbow-length black trimmed sleeves with a slight bell shape. 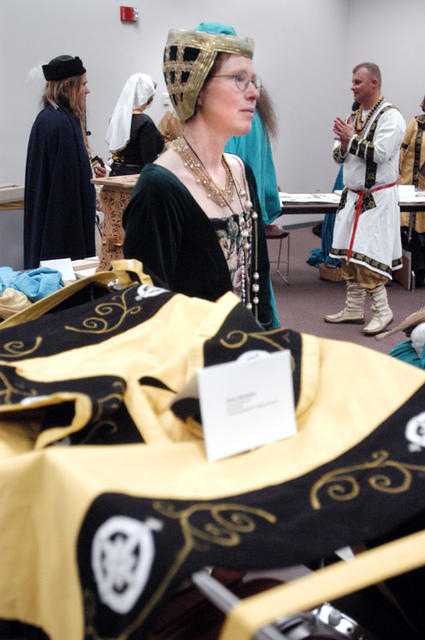 The knee-length sideless surcoat is also faux silk in bronze tones with a geometric pattern, black and gold trim, and buttons grouped in threes. Headwear for this outfit would be a veil with some type of circlet, possibly metal, fabric, or flowers. Ok, Susan made her own dress, but I put it here because I helped with the patterning. 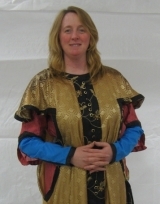 And its a great example of a gothic fitted dress constructed by the methods of Robin Netherton. The V of the neck opening is formed by sliding the center front opening toward the shoulders. The dress is fitted on the individual as they lay on the floor, allowing gravity to move important body parts (I'm trying to be decent here) to a place where they will rest while dressed. All of the upper support is provided by the dress, not "modern" methods like corsets or boning. The fitted sleeves are seamed up the back instead of under the armpit. On this dress the front is laced down to the waist with handstitched eyelet holes. 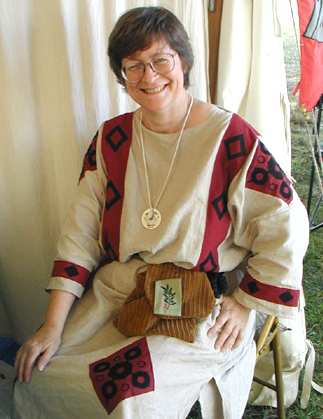 Wools and linens were common fabrics for this type of dress, as they had stretch, support, and "life", or the ability to mold to the body they covered. Nice job Susan! This warm mongolian outfit was very suitable for the cold weather parade I attended. Being a nomadic Asian culture, silk and wool were common fabrics, and blues and reds were their favorites. The hat is of red silk with a fur trim. The coat fastens with ties on the right breast (the most common side for fastening) and has extremely long sleeves which cover the hands when cold, instead of using mittens. Belts were often exchanged between tribes, to ensure friendship. Baggy pants and boots round out the ensemble. Elements of historical culture can still be found today in Mongolia, from the yurt homes to the silk clothes. Some of the coolest headwear comes from the women in this group. It is a culture worth investigating if you can. Here my sister, Elaine, is wearing an early period outfit called a Dalmatica. The fit is similar to an oversized longsleeve t-shirt. 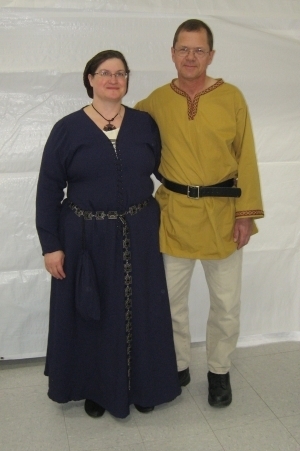 The basic garment, a T-tunic, is relatively simple to design. The decorations are what make the garment specific to its time and culture. Here is a closeup of the headpiece, with a different red dress, this time made of real linen. The hair is actually mane hair from my horse, which I braided, twisted, and wove. The veil under the headpiece is a necessity, both to better see the headpiece and to keep the braids from itching my face! This is one of my favorite dresses. 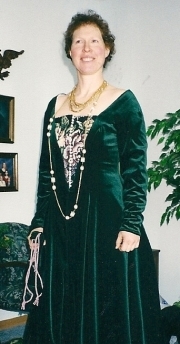 It is in the late15th century German style and is made of green velvet. The skirt is lined with pink and has a matching pink underskirt. At the time this style was popular, excess fabric and jewelry were a sign of wealth, thus one might drape the train of the skirt over an arm to show the underskirt (more fabric). This was about the time that corsets began to be used, as opposed to utilizing lacing of the actual dress for bodice support. This is the hat I wear with the dress. Headwear for both men and women was very common for many parts of history. It is important to make sure your accessories match properly with the time and culture of your outfit. If they do, they make the whole picture look perfect and really adds to the flavor of historical reenactment.